Bees Matter is calling on Canadians to get out and plant pollinator-friendly gardens in support of the important role honey bees play in all of our lives. Bees Matter is designating the week of June 5 – 12, 2017 as National Planting Week to encourage as many Canadians as possible to plant pollinator-friendly gardens. This year, as Canada marks its 150th birthday, Bees Matter’s goal is to distribute its 100,000th Buzzing Gardens seed kit. In the first two years, more than 70,000 seed kits were distributed from coast to coast. Many factors can impact honey bee health, including inclement weather, parasites, diseases and inadequate nutrition. While Statistics Canada reported that honey bee populations increased again in 2016—reaching new heights in the number of hives across Canada—there is still more that can be done. Communities in Bloom, a Bees Matter partner since day one, is also encouraging its members to help increase the number of pollinator gardens through participation in National Planting Week. 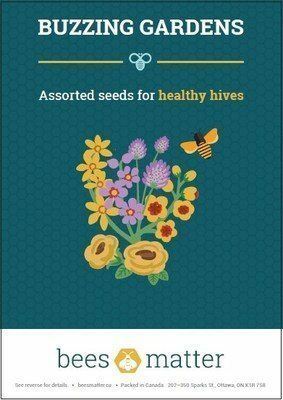 Canadians can get involved by visiting beesmatter.ca to order a free Buzzing Gardens seed kit and learn about honey bee health. Every Buzzing Gardens seed kit contains seasonal and perennial seeds from five varieties of flowering plants to attract and feed pollinators. Each seed packet contains enough seeds to plant a five-square foot garden. All of the seeds are non-invasive and native to Canada and recommended by Pollinator Partnership Canada. The seeds are specially selected because they are attractive and nutritious to honey bees, and can be grown in gardens, patios and balconies all over the country. Sign up for a free Bees Matter seed kit, plant your Buzzing Gardens during National Planting Week and share your photos using #PlantforBees.